Old map by CHEREAU - A view of Westminster bridge. Vue du pont Westminster. Publisher: CHEREAU, J. / AVELINE, P.A. Title: A view of Westminster bridge. Vue du pont Westminster. Size: 14.6 x 22.8 inches. 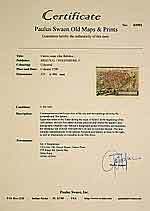 Condition: A larger paper copy (495x645mm. ), in very good to mint condition. 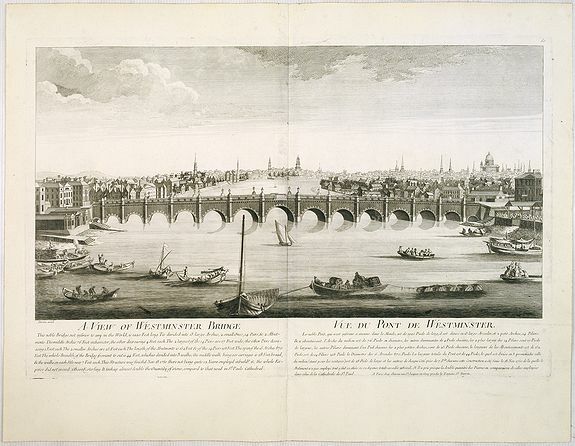 A very decorative and extremely rare town-view of river Themes and Westminster bridge in London, including a six line description in French and English. Published by Jacques Chéreau, (1688 - 1776). With the address " A Paris chez Chéreau rue St. Jacques au Coq proche la Fontaine Dt. Severin." and plate number "60" in upper right margin.